Nail fungus, which is also called Onychomycosis or tinea unguium, is an infection caused by fungus. When it comes to nail diseases or infections, nail fungus is the most popular type. Nail fungus may infect the fingernails and toenails; however, the most popular is toenail because they are more often in a dark and moist environment which provides a great place for the fungus to grow. There are four types of nail fungus which will be explained in the following article. This type of toenail fungus, which is the most popular, will start at the tip of the toenail and make its way towards the cuticle as it progresses. The meaning of distal is “distance from”; the definition of subungual means “under the nail”; while Onychomycosis is simply the scientific name for toenail fungus. Distal Subungual Onychomycosis affects the nail plate and is caused by a fungus that has adapted to live in the skin, hair and nails. People with this type of nail fungus may experience inflammation which could cause the nail to detach from the nail bed and/or thickening of the nail. If no treatment is given to the nail this could give a space for infectious bacteria and fungus to grow making the nail appear yellow or brown. This is the second most popular type of fungus, which can also affect both the fingernails and toenails. Contrary to the other types of nail fungus, the WSO will start on the top layer of the nail and will eventually affect the entire nail. One to two percent of the population have WSO and it is more common among those of Italian decent who are over 65 years of age. Studies also show that 30% of people who have HIV will be affected by nail fungus, and those with WSO can often not be treated with topical treatment. This is sometimes the case with other people who have WSO as the fungus is growing inside the nail and the cream will not penetrate the nail. Before being diagnosed with WSO, people have often been affected with the condition for a few years without noticing anything. Some of the symptoms associated with WSO are opaque, brittle and deformed nails; however, the first thing people will notice is white spots on the nails. This is the least popular nail fungus in people who are health, but more popular in people who are immunocompromised; meaning those who either have something that lowers their immune system such as HIV and autoimmune diseases or people who use intravenous drugs. Often times when someone gets this type of fungus and their immune system has not been affected by anything; they will test the patient for HIV. However, it is important to remember that having this type of nail fungus does not mean someone necessarily has HIV. The fungus begins at the cuticle and will make its way to the tip of the nail as the nail grows. People may also notice a yellow or white spots near the cuticles, as well as, bumps on the nails as it grows. Finally, the skin around the nail may become red, inflamed and swollen. Sometimes, there is also pus, which causes doctors to misdiagnose the fungus as a bacterial infection and prescribe antibiotic, but antibiotic will not cure fungus. Contrary to other types of nail fungus, Proximal Subungual Onychomycosis must be treated with pills rather than topical creams. This final type of nail fungus mostly affects the fingernails rather than the toenails. The fungus will affect the area surrounding the nail and it is the least popular type of nail fungus. Most people who get this type of nail fungus, are people who put their hands in water often and most of the time, it requires the person to have prior infection or trauma of the nail. This type of nail fungus is most often treated with topical creams. 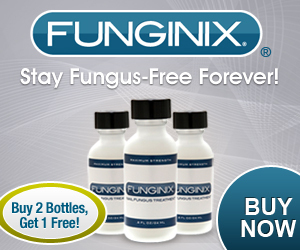 After consulting with a doctor, if a person chooses to use a topical cream to treat the fungus, there is one type that works particularly well called Funginix. This cream is completely natural and will not only make the fungus go away, but if used for six months it will prevent it from ever coming back.